We are preparing for the Third Annual Bike fest weekend. The mission of the SouthCentral Bike fest is to raise money to help ease the financial burden of local cancer victims in Southside Virginia. All money raised through the efforts of this fun filled weekend are kept local. 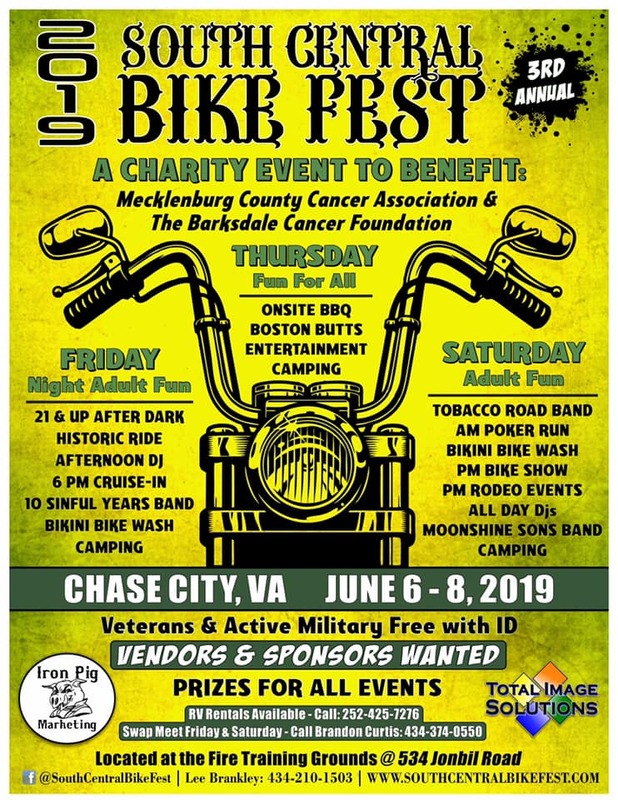 The SouthCentral Bike fest Committee splits the proceeds and donates it to the Mecklenburg County Cancer Association and the Barksdale Cancer Foundation. They in turn distribute the money to cancer victims in Mecklenburg and Charlotte Counties. The families are issued a check to help with expenses to maintain victims needs during treatments. Please come out and enjoy this weekend as well as support a great cause in our community. A group of local motorcycle enthusiasts wanted to provide a weekend dedicated to motorcycle riders and others who enjoy the friendship, camaraderie and just plain fun that accompanies the event. The steering committee was formed and will continue to work diligently to see that this is an annual event, one that will improve over time using suggestions from people just like you! For bikers, by bikers! Join us on June 6-8, 2019 for the 3rd annual SouthCentral Bike Fest as we raise money to assist area cancer victims. It’s a weekend of camping, bands, DJs, cruise-ins, bike shows, poker runs, bike rodeos, fireworks, bikini bike washing, swap meet, and more. It’s not just another bike fest. We will kick off at 5:00 pm on Thursday evening with a town-sponsored BBQ supper & DJ. On Friday at noon, join in on a 2 hour or 4 hour historic ride (southern style) dedicated to our fallen bikers and veterans. We have some fantastic country roadways with many historic stops for your riding pleasure. DJs (Brad & Wildthang), The 10 Sinful Years Band. Saturday morning begins at 9AM with a poker run and lots of other events accompanied by music from SOUNDHOUSE DJ Services, The Tobacco Road Band, & Moonshine Sons will finish up the evening. All veterans, active military, and first responders are granted free admission with proper ID. We also have onsite camping and RV rentals available. Early entry at 3 PM on Thursday, all bikes/campers will be out by Noon Sunday.